Apophyseal spinous process avulsion injury was first described in 1941. Since then, there have been sparse additional reports in the literature. The authors report their second case, involving an elite adolescent tennis player. The patient underwent surgical excision of the avulsed spinous process 12 weeks after initial presentation and experienced complete resolution of back pain. The authors provide the first reported histopathological analysis of the avulsion fracture site in the literature for both of their cases. The avulsion injury of the interspinous ligament was characterized by hypercellular fibrocartilage tissue, similar to that seen in severe Osgood-Schlatter’s disease. The key physical examination finding in patients with avulsion spinous process fractures is acute tenderness directly over the fracture site that worsens with flexion rather than extension (unlike in spondylolysis). Patients should have routine radiographs, including dynamic flexion-extension views, magnetic resonance imaging, and computed tomography. The authors conclude that after 6 months of nonsurgical management for an athlete, surgical excision should be offered as an alternative. In both of their cases, nonsurgical management failed. Surgical excision offers definitive and simple treatment, as well as early return to athletic activities. Both patients were allowed to return to their competitive level of performance 6 weeks after surgery. The authors are from the Department of Orthopedic Surgery (SMK, JM, SM, SQ, ACH) and the Department of Pathology (FR-Q, ALS), The Mount Sinai Medical Center, New York, New York. Correspondence should be addressed to: Andrew C. Hecht, MD, Department of Orthopedic Surgery, The Mount Sinai Medical Center, 5 E 98th St, 9th Floor, New York, NY 10029 ( Andrew.Hecht@mountsinai.org). Apophyseal spinous process avulsion injury was first described by Schmitt1 in 1941. 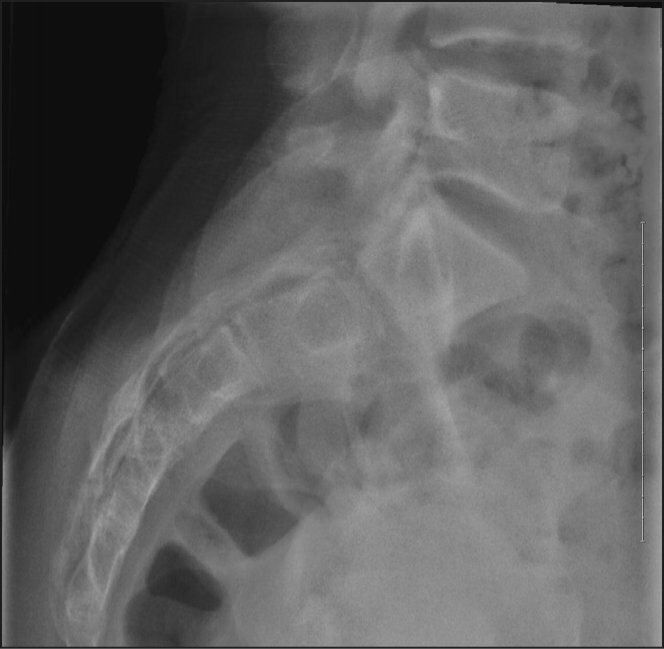 Schmitt described an adolescent with abnormal radiographic signs in the spinous process. However, it was not until 1951 that Schmitt and Wisser2 reported additional adolescent cases and drew the parallelisms to Osgood-Schlatter’s disease, Sever’s disease, and Kohler’s disease. The authors concluded that what they were describing was a juvenile version of Clay Shoveler’s disease (avulsion fracture of the cervical and thoracic spine). The patients they described were boys, age 14 to 16 years, who reported heavy work prior to the onset of symptoms. The reported symptoms were pain, tenderness to palpation over the affected spinous process, and edema of the soft tissues overlying the affected spinous process. Radiographically, Schmitt and Wisser2 described an irregularly shaped and displaced spinous process. In 1954, Ravelli3 coined the term “Schmitt’s disease.” There was no pathological examination performed. In 1957, Weston4 further added to the case series with 2 additional adolescents, both boys. In all, 6 cases reported by Schmitt and Wisser2 and Weston,4 there was no surgical management and the pain resolved only when patients avoided sports and heavy lifting. Total pain resolution occurred between 3 and 20 months. After healing, the spinous process had an abnormal shape and, in some cases, remained nonunited, deformed, and displaced. Schmitt and Ruecker5 provided long-term follow-up of patients in 1979, and reported that stress injuries in adolescents were localized to the tip of the spinous process. They reported that the natural history of the disease is benign. Healing was achieved by the formation of a pseudoarthrosis, which consolidates after several months or years. Since these original publications, only 2 case reports in the English literature have discussed spinous process avulsion fractures. In 2000, Mannor and Lindenfeld6 described 2 female adolescent gymnasts who presented with low back pain and were clinically diagnosed with spinous process apophysitis. The patients underwent conservative management, requiring them to stop participating in gymnastics. Once gymnastic activity was stopped, resolution of the symptoms occurred at 2 months and 2.5 months. Only 1 patient continued with gymnastics. The current authors previously reported a spinous process avulsion fracture in an adolescent dancer.7 The patient presented after 9 months of persistent low back pain and was treated with 8 months of conservative management with little pain relief. She underwent surgical removal of the fragment, which appeared to be a mobile nonunion, Her pain resolved and she was able to return to her full level of competitive dance by 6 weeks postoperatively (Figure 1). The authors herein describe a second, similar case in an elite tennis player and provide the first reported histopathologic analysis of the avulsion fracture site in the literature for both cases. Sagittal computed tomography scan of the authors’ previously reported case demonstrating avulsion of a small fragment of bone off the L3 spinous process (A). Sagittal magnetic resonance image showing an avulsion fracture at the L3 spinous process (B). Three-phase bone scan showing increased uptake at the L3 spinous process (C). A healthy 12-year-old elite tennis player presented after 4 weeks of lower back pain exacerbated by flexion and extension of the lumbar spine. He had experienced increasing difficulty training and playing tennis. Normally, he played 5 to 6 hours of tennis daily as part of a preprofessional tennis and educational program. On physical examination, the patient was neurologically intact. As part of the initial workup, plain radiographs and magnetic resonance images (MRI) were obtained. 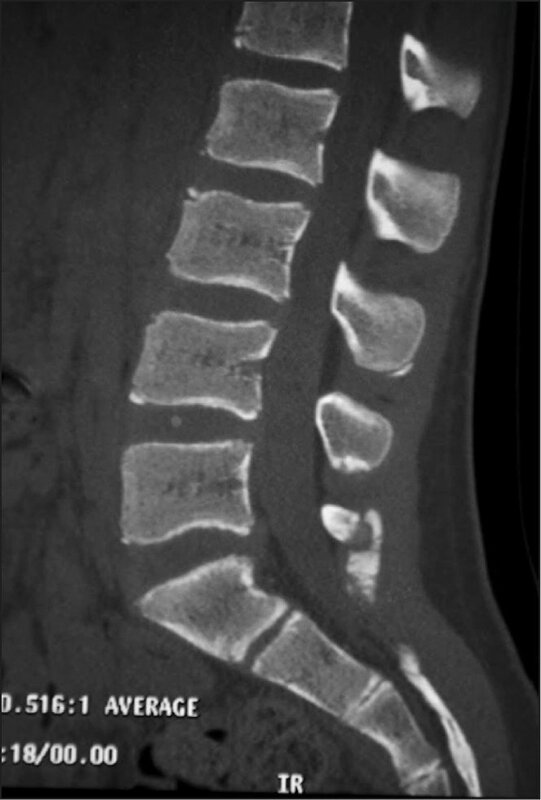 Lumbar spine anteroposterior, lateral, oblique, and flexion-extension radiographs yielded normal findings, with no evidence of spondylolisthesis, fracture, or instability. However, the L5 spinous process was noted to appear dysplastic (Figure 2). Magnetic resonance imaging demonstrated marrow edema within the left pars interarticularis at L5. A small posterior synovial cyst at the L5-S1 facet joint was also demonstrated. The patient was placed in a Boston overlap brace and restricted from tennis for 4 weeks for presumed spondylolysis. After 5 weeks, the patient continued to have pain with extension and developed new point tenderness of the L5 spinous process. Computed tomography (CT) was performed, revealing an avulsion fracture of the L5 spinous processes (Figure 3). The patient had no lasting relief with a trial injection at L5. Because conservative management had failed, surgery was planned to remove the fracture fragment. Sagittal lumbosacral plain radiograph that was interpreted as showing a dysplastic spinous process with no evidence of fracture. Sagittal computed tomography scan showing avulsion of the L5 spinous process, seen in the currently reported case. At the time of surgery, 12 weeks after initial presentation, the fractured spinous process was mobile and easily palpated, as was a dense calcific-type mass within the fracture line. The fractured piece of spinous process was detached. The dense calcific-type mass extended down to the ligamentum flavum and under S1. A small, midline laminectomy of S1 was performed to remove the entire mass en bloc. This required additional removal of the ligamentum flavum in concert. The dorsal synovial cyst was exposed and also removed. The remaining L5 spinous process was preserved. At 1 week postoperatively, the patient had complete resolution of back pain. He had no numbness, tingling, or loss of motor or sensory function. He began physical therapy. At 5 weeks postoperatively, the patient continued to be pain-free and resumed his competitive tennis regimen. The patient’s fractured spinous process and removed en bloc calcific-type mass were sent for pathological examination (Figure 4A). Microscopically, the avulsion injury of the interspinous ligament was characterized by hypercellular fibrocartilaginous tissue with neovascularization, clustering of chondrocytes, matrix production, and endochondral ossification (Figure 4B). There were similar changes in the patient who was previously described.7 Degenerative changes in the cartilaginous tissue of both patients—as evidenced by clustering of the chondrocytes—demonstrated the chronicity of this injury, suggesting that the acute avulsion fracture was indeed the result of chronic application of forces stronger than the ones holding the bone together. The findings of extensive neovascularization, chondrocytic cloning, and prominent endochondral ossification were consistent with posttraumatic changes due to an avulsion injury of the spinous process in an adolescent athlete. Avulsed fragment of the L5 spinous process. The fragment of cortical bone is surrounded by a pale white cartilaginous proliferation (callus) (A). Microscopic view of the insertion of the interspinous ligament. This section contains hypercellular cartilaginous tissue with neovascularization, disordered organization, matrix production, and endochondral ossification with woven bone. The chondrocytic clustering implies a chronic injury pattern (hematoxylin and eosin, original magnification ×4) (B). Callus from the L3 spinous process from the previously described patient with the same injury pattern. Note the hypercellular, “pseudosarcomatous” appearance of the callus in this case (hematoxylin and eosin, original magnification ×4) (C). An understanding and review of vertebral embryology provides an explanation regarding why young athletes would be particularly prone to this type of injury. Five secondary ossification centers appear in the vertebrae after puberty: 1 at the tip of the spinous process, 1 at the tip of each transverse process, and 2 annular epiphyses, on the superior and inferior rims of the vertebral bodies, respectively. These secondary ossification centers fuse by age 25 years, making these areas a particularly weak point in the skeleton of children and adolescents; therefore, tendons or ligaments near a growth plate can pull hard enough to cause the bone to break. The end result of this continuous injury is an avulsion fracture. Lumbar apophyseal avulsion injury is exceedingly rare in the literature. The current report, the authors’ previously reported case,7 and the 2 cases reported by Mannor and Lindenfeld6 are the only 4 in the English literature. Previously reported spinous process apophyseal injury cases have occurred in the thoracic spine.2–5 The actual epidemiology in the population is unknown. The key physical examination finding in patients reporting back avulsion fracture is acute tenderness directly over the spinous process that worsens with flexion rather than extension (unlike in spondylolysis). Patients should have routine radiographs, including dynamic flexion-extension views. Magnetic resonance and CT remain the best initial imaging modalities, with confirmation by bone scan. In both of the cases reported by the current authors, nonsurgical management failed.7 In their currently described case, the patient’s initial imaging, including MR, showed no fracture. On reviewing the MRI, the current authors concluded that the slices were too thick and that proper protocol had not been followed. Nonsurgical management was only attempted for 6 and 8 months. According to Weston,4 with cessation of activities, 1 patient had pain resolution at 5 months. The other patient required cessation of activity and splinting before complete resolution at 3 months. Mannor and Lindenfeld6 reported resolution of pain with nonsurgical management in their patients within 2 and 3 months. This led the current authors to conclude that, in the vast majority of spinous process apophyseal injury cases, the injury is self-limiting and heals nonsurgically, much like Osgood-Schlatter’s disease. However, also similar to Osgood-Schlatter’s disease, there are cases that are refractory to nonsurgical management that benefit from surgical excision. This may be true in elite athletes, who often need extremes of flexion for their sport or activities. These patients also often do not have the luxury of stopping their activities. In all cases, a trial period of nonsurgical management is recommended. However, the current authors believe that after 6 months of nonsurgical management for an athlete, surgical excision should be offered as an alternative. As demonstrated, surgical excision provides definitive and simple treatment and allows early return to play. Return-to-play criteria include full pain-free range of motion, appropriate aerobic conditioning, normal strength, and a demonstrated ability to perform sports-related skills without pain. Athletes should also demonstrate adequate spinal awareness and dynamic postural control. In this case, the patient was allowed to return to his full level of competitive tennis 6 weeks postoperatively. In the authors’ previous case report, the patient was also allowed to return to dance 6 weeks postoperatively. The authors have described a second case of lumbar spinous process apophyseal injury and provided the first reported histopathologic analysis of the avulsion fracture site in the literature. The authors concluded that after 6 months of nonsurgical management for an athlete, surgical excision should be offered as an alternative. Surgical excision has been demonstrated to provide definitive and simple treatment and allows early return to play. Schmitt HG. An inflammatory process in the tip of the spinous process of the thoracic vertebrae. Röntgenpraxis. 1941; 13:320. Schmitt HG, Wisser P. Shoveler’s disease in adolescents: apophyseal fractures of the spinous processes of the thoracic vertebra. Langenbecks Arch Klin Chir Ver Dtsch Z Chir. 1951; 268:333–340. Ravelli A. Epiphysial necrosis of the spinous process of a lumbar vertebra. Radiol Clin. 1954; 23:162–166. Mannor DA, Lindenfeld TN. Spinal process apophysitis mimics spondylosis: case reports. Am J Sports Med. 2000; 28:257–260. Bullough PG. Nonneoplastic diseases of bones. In: Sternberg SS, Mills SE, Carter D. Sternberg’s Diagnostic Surgical Pathology, 5th ed. Philadelphia, PA: Lippincott Williams and Wilkins; 2010. Moore KL, Persaud TVN, Torchia MG. Development of the vertebral column. In: Before We are Born: Essentials of Embryology and Birth Defects, 8th ed. Philadelphia, PA: Elsevier Saunders; 2012. Egol KA, Koval KJ, Zuckerman JD. Pediatric orthopaedic surgery: general principles. In: Handbook of Fractures. Philadelphia, PA: Lippincott Williams and Wilkins; 2010. Bono CM. Low-back pain in athletes. J Bone Joint Surg Am. 2004; 86:382–396. Hosalker H, Dormans J. Back pain in children requires extensive workup. Biomechanics. 2003; 10:51–58.